April 18, 2017 "Instructions For Irs Form 1040 - U.s. Individual Income Tax Return" contain the latest filing requirements for the IRS-issued Form 1040. Download your copy of the instructions by clicking the link below. IRS Form 1040 is a tax form issued by the United States Internal Revenue Service. Get a faster refund, reduce errors, and save paper. these instructions or go to IRS.gov/FreeFile. See What’s New in these instructions. When and Where Should You File? and in your local directory. You can also call us at 1-877-777-4778.
rights. Know them. Use them. List. 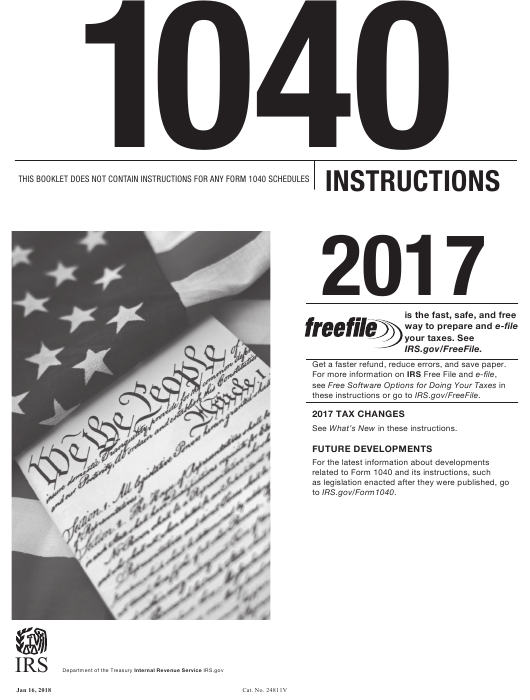 You can also get this publication at your local IRS office or by calling 1-800-829-3676. Form 8962 to your return to reconcile (compare) the advance payments with your premium tax credit for the year. information you need to complete Form 8962. 1. You will need Form 1095-A from the Marketplace. 2. Complete Form 8962 to claim the credit and to reconcile your advance credit payments. to have health care coverage. who is eligible for the premium tax credit, see the Instructions for Form 8962. Why have 49 million Americans used Free File? Security—Free File uses the latest encryption technology to safeguard your information. Flexible Payments—File early; pay by April 17, 2018. Greater Accuracy—Fewer errors mean faster processing. Go Green—Reduce the amount of paper used. get their refunds faster by using direct deposit and e- le. If your adjusted gross income was $66,000 or less in 2017, you can use free tax software to prepare and e- le your tax return. Earned more? Use Free File Fillable Forms. name commercial software products and e- le available for free. Seventy percent of the nation’s taxpayers are eligible. questions will help ensure you get all the tax credits and deductions you are due. It’s fast, safe, and free. your situation. Some software providers offer state tax return preparation for free. Fillable Forms does basic math calculations. It supports only federal tax forms. electronically le their own tax return with the assistance of an IRS-certi ed volunteer. IRS.gov is the gateway to all electronic services offered by the IRS, as well as the spot to download forms at IRS.gov/Forms. Make your tax payments electronically—it’s easy.